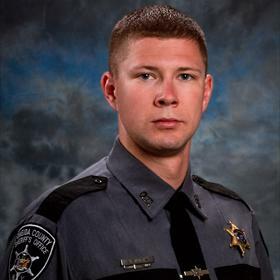 Deputy Sheriff Kurt Wyman was shot and killed during a standoff following a domestic disturbance in Knoxboro. Officers responded to the scene of a domestic disturbance at approximately 9:00 pm when the man barricaded himself in his garage with a shotgun. Negotiators were attempting to get the man to surrender at approximately 2:00 am. Deputy Wyman was approaching the man with his taser when the subject opened fire, killing him. The suspect was shot in the exchange of gunfire and taken into custody. He was subsequently convicted of Deputy Wyman's murder and in April 2012 he was sentenced to life in prison without the possibility of parole. Deputy Wyman was a U.S. Marine Corps veteran and had served with the Oneida County Sheriff's Office for four years. He is survived by his expectant wife and 18-month-old son. His wife went into labor upon being informed of Deputy Wyman's death and gave birth to his daughter.